When’s the last time you took in a four-act play during lunch? Well, that’s precisely what we did on June 3, 2015, in the theatre of Continuum Boston’s spacious kitchen. Eric Hellweg—who stars as the Managing Director of Digital Strategy and Editorial Director of Harvard Business Review—treated us to a moving, informative one-man show called HBR: A Study in Transition (A Play in Four Acts). OK, it wasn’t really a play, but Hellweg’s lecture was a rockin’ quartet of stories about technological migration, epic culture change, and disruptive business chutzpah. 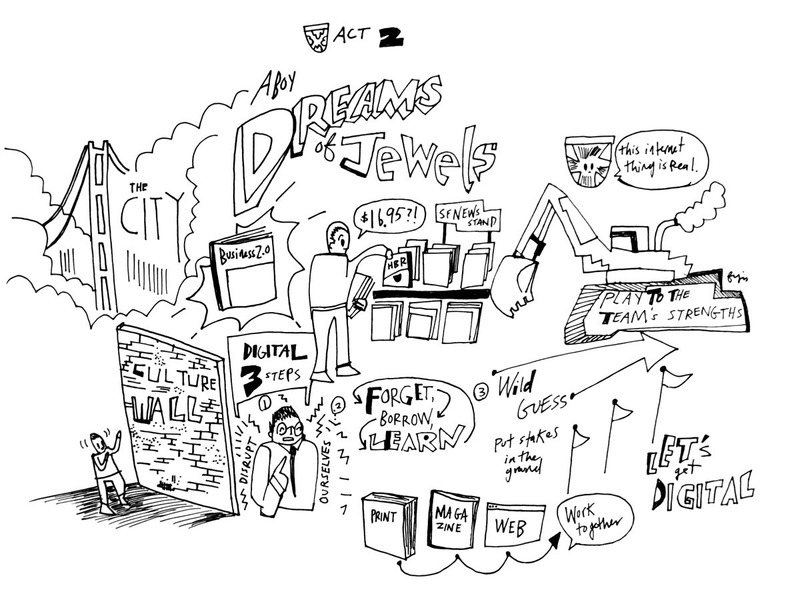 In the spirit of that Hellweg-ian drama, Fish McGill, one of our resident envisioners, whipped the following theatrical live-drawings during the talk. They illustrate, in bold, lively strokes, Hellweg’s personal tale of publishing evolution. 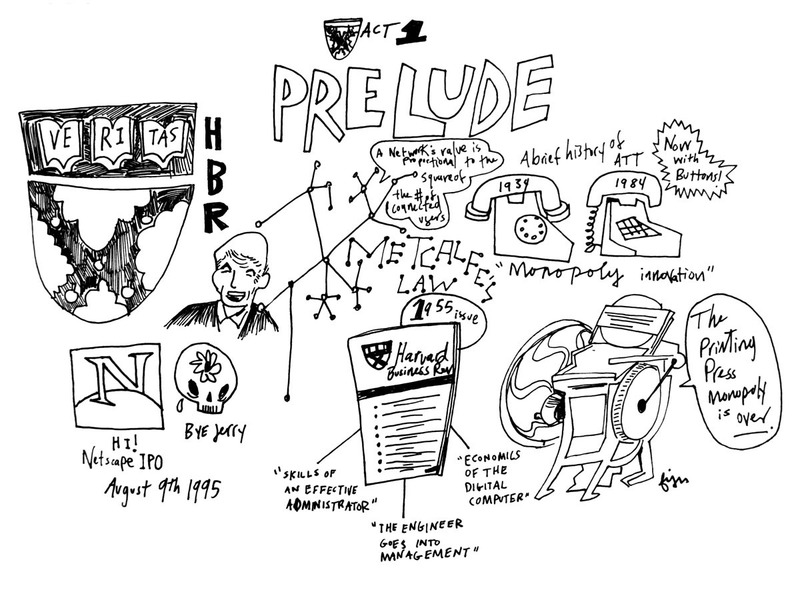 The “Prelude” kicked off by introducing us to Bob Metcalfe and his famed law (“the value of a telecommunications network is proportional to the square of the number of connected users of the system (n2).”) Hellweg then segued into the notion of innovation in times of monopoly—there ain’t much, and wasn’t much in the good old days of print media—until the Big Media Change. Hellweg pinpointed: August 9, 1995, the day of Netscape’s IPO and Jerry Garcia’s demise. He talked about the 93-year-old Harvard Business Review brand, the challenges faced by print advertising, and gave us a glimpse into where HBR had been. In this section, Hellweg was living in San Francisco, jamming in a band, and helping to start up the funky new business mag called, appropriately enough, Business 2.0. Hellweg recalled his first encounter with HBR at a real life newsstand, in 1997, as Business 2.0 was starting up. While initially staggered by the cover price—$16.95—he had a tougher time slogging through the articles. But as he read he took note of the jewels buried within. Fast-forward to 2006: HBR chose him as their first online hire. Figured the whole thing would be a three-year gig in which he’d unearth the jewels he spotted in 1997. Not quite. Turned out, he’d walked into a big strong cultural wall—with a long legacy of publishing leading-edge business content, the org was skeptical of some of the new digital formats. The CEO decided to create a new digital division in the company and paired Eric with another new digital hire, Josh Macht, to help run it. After a safe landing, he went about helping HBR disrupt itself, Clay Christensen style. HBR instituted a program of Forget, Borrow, and Learn. They shed some of the content-creation processes, in order to move faster. They borrowed the brand and the strong in-house connections. They learned what customers valued online and how they defined quality. To grossly oversimplify: With much work and a bit too much force, there was unity. The distinction between the print magazine and the website began to blur. 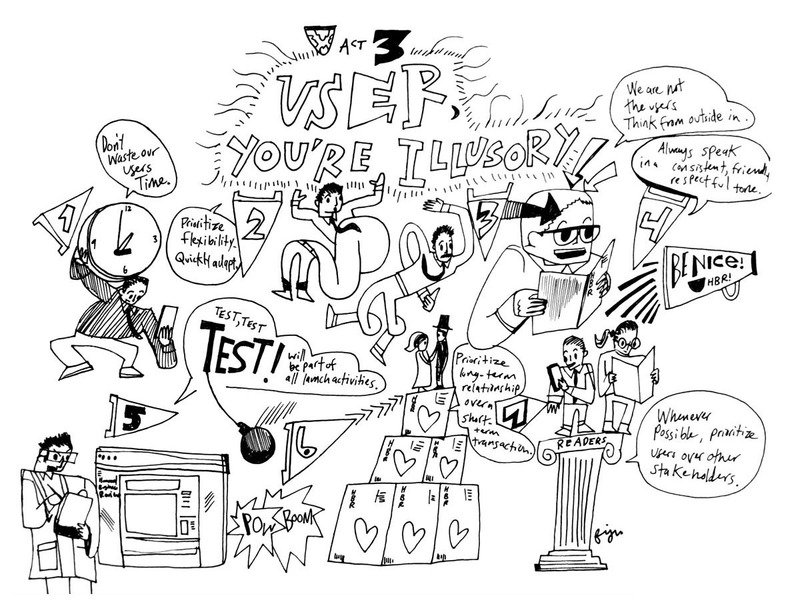 The core of Act 3, which Hellweg called, with an ironic nod to Guns N' Roses, “User, You’re Illusory,” focused on HBR’s epic quest to focus in on the customer experience. (1) Don’t waste our users’ time. (2) Prioritize flexibility; quickly adapt. (3) We are not the users. Think from the outside in. (4) Always speak to our users in a consistent, friendly, respectful tone. (6) Prioritize a long-term relationship over a short-term transaction. (7) Whenever possible, prioritize users over other stakeholders. Hellweg capped things by informing us of his evolution from editor to product manager, and how HBR is attempting to bring the product management mindset into its own culture. As you’ll see from the illustration above, he’s aiming to situate himself and his company at the intersection between user experience, technological abilities, and business goals. It left us in a kind of cliffhanger moment: Will HBR manage this transition successfully? Will he? 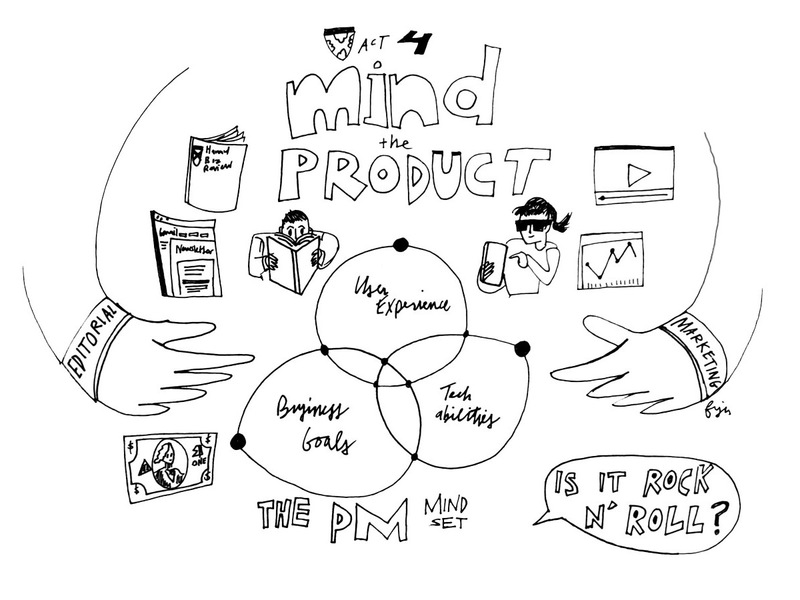 Toward the end, some troublemaker asked Hellweg what was lost as he and HBR made the transition from the editorial mindset to the PM mindset. Hellweg responded that, when working on a project, he always asks himself some musical questions. Is it punk? Easy listening? Rock and roll? He answered that the HBR project is indeed rock and roll. And with that, he closed out the final act to some decisively appreciative applause.